We spent last week on a Spring Break vacation. The boys were all out of school but I had to drag my school assignments with me because my online classes do not take breaks. Ugh! But luckily for me our trip included stops at two Georgia State Parks and a ride through the Great Smokey Mountain National Park. What a way to break up the drudgery of note taking. To keep from piling on the info and pictures in a super long post, I’ll be posting the trip in separate posts to highlight each wonderful stop on our vacation. 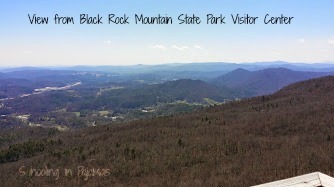 Black Rock Mountain State Park is located in Rabun County Georgia. 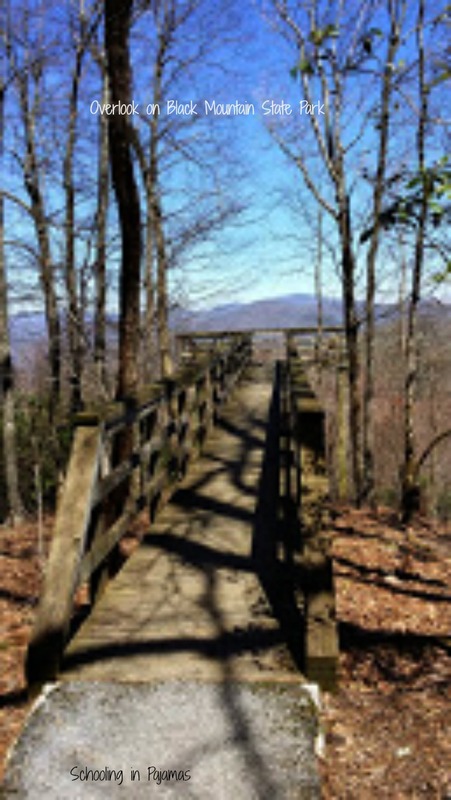 It is located three miles north of Clayton in Mountain City right off of Highway 441. The park is open from March 16 to November 30 with park gates open from 7 a.m. to 10 p.m. and the visitor center hours are 8 a.m. to 5 p.m. daily. *Tip: You really have to pay attention to the road sign for the park. It does not have an elaborate sign like most of the parks I have been to. It is basically a green road sign with an arrow pointing to the turn which is onto a house lined narrow road. You must go through a four-way stop and continue on the narrow road as it winds up the mountain. It is a two lane road but be aware of how narrow it is and the constant curves. We had hikers on the road as we went up which made it a bit harder because we had to move over into the other lane while hoping another vehicle was not coming our way. Just keep these in mind if you decide to visit. Here is some basic information you can get on the website and in the guide you get at the visitor center. This lookout leads to the picture below. The kids found it fascinating that the cloud left such a big shadow. We waited around for about 5 minutes and watched the shadow move as the cloud did. 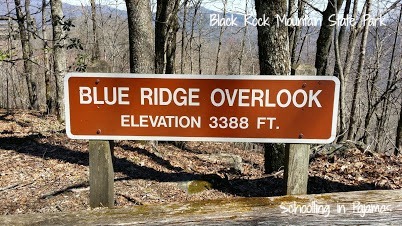 One of the signs on the way up the Black Rock Mountain road. This is the view from the Visitor Center’s lookout. They have one on either side of the center. You get to them by going inside to the shop then out a door on either side. They are not connected except by the shop itself and they are railed. We went out and at first the vertigo was something to get over but it only took a few seconds then we were in awe of our view. You can see the town we went through and all the hills & mountains around for miles. Beautiful view! 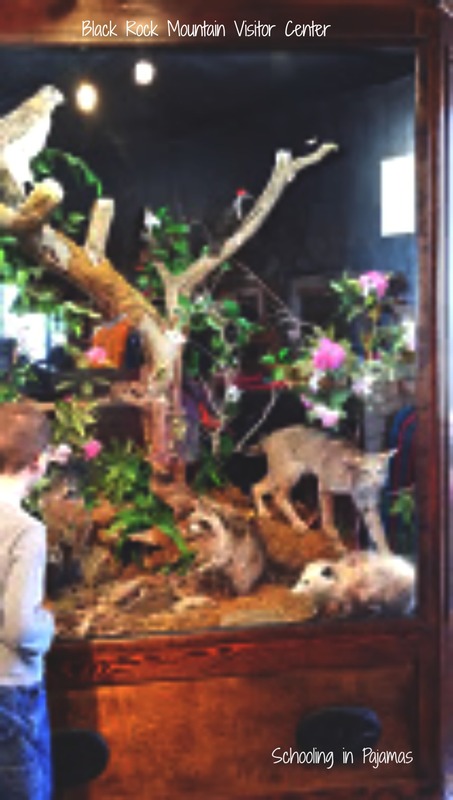 This is one of the displays in the visitor center. They have a small replica of a log cabin in one of the corners of the shop with some interactive displays. It is a small visitor center but the staff are extremely nice and it is worth the visit. 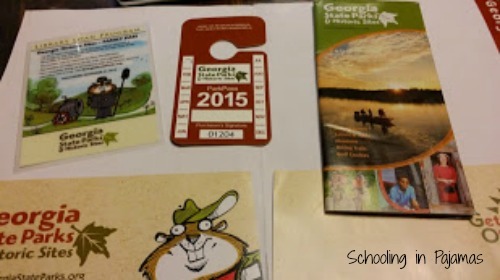 If you are in Georgia, I would recommend checking with your local library to see if they offer the Georgia State Park Pass kit. Our library does and it has come in real handy. A state park pass as well as a state historic pass are both on our to get list but not in our budget right now. So the kit from the library is a life saver. 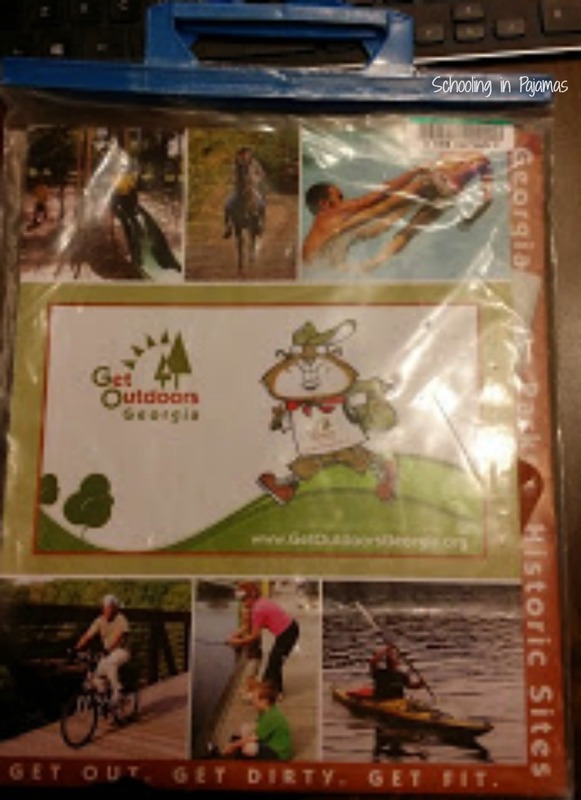 It consists of a park pass (already stamped for the year), a historic park entrance pass for 4 people, and a state parks brochure. Ours comes in a handy folder and our library keeps it in a plastic bag/sleeve. We checked ours out before our trip and it was very helpful in getting my husband to stop since he knew we did not have to come up with the $5 parking fees to the places I wanted to stop. Here is a photo of the kit we get. Our family is known for collecting shot glasses on our vacations and various trips. However, when we visit a State or National park we collect patches. 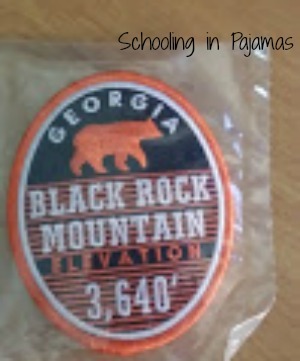 Here is our patch for Black Rock State Park. We keep our patches in a small scrapbook you would use for 5×7 photos. The book has room for one picture in a sleeve per page with a small lined column on the side for writing.